The last gasp of warmth (high of 41) before the cold hit seemed like a good time to continue my skirting project, which is now moving around to the west side of the trailer. This area is home to the hitch --- the big metal thing that connects to a truck when a mobile home is being hauled to a new location. As a result of the hitch, I ended up having to do a bit of piecework with the insulation, but hopefully it will still mostly do its job. Meanwhile, since our trailer is set atop slanted ground, the downhill part of the west face of the trailer presented yet another obstacle --- the flashing is no longer wide enough to reach from the walls to the ground. 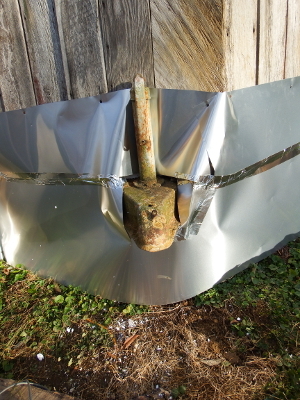 I overlapped two pieces of flashing and sealed the seam with that metal tape you use to seal ductwork (not duct tape --- or perhaps this is real duct tape?). Only time will tell whether the little bit of rain this area gets beneath its large overhang will be sufficient to work the tape loose, but since I only taped the seam for aesthetic purposes, we can live with untaped seams if they occur. Next step will be mounding soil up around the base of the skirting the way I did on the southwest end of the trailer. I let Mark be the final deciding vote on planting this area and he chose grapes, so the cuttings I started will end up in this area come spring. 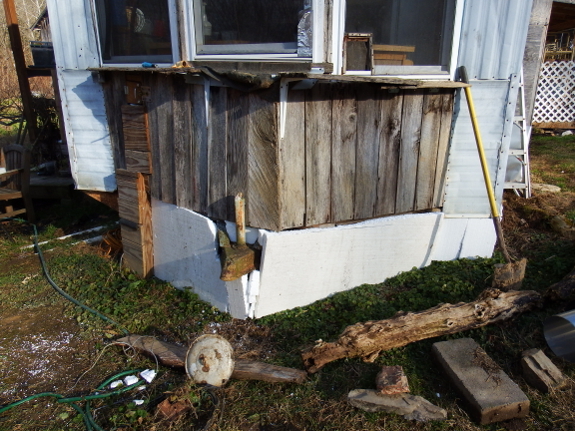 And, in the meantime, I'll keep plugging away at skirting as weather permits. Next up is the soggy north face of the trailer, where I hope to include an access door just in case we someday need to crawl beneath our mobile home. ever considered removing the hitch? You inspired me to get a used doublewide instead of building from scratch. The delivery guys unbolted the hitches and placed them underneath the house in case we ever need them. Now, if only my many DIY skills were worth any good with construction/home repair, my mobile would be at least as good as yours was in the beginning. 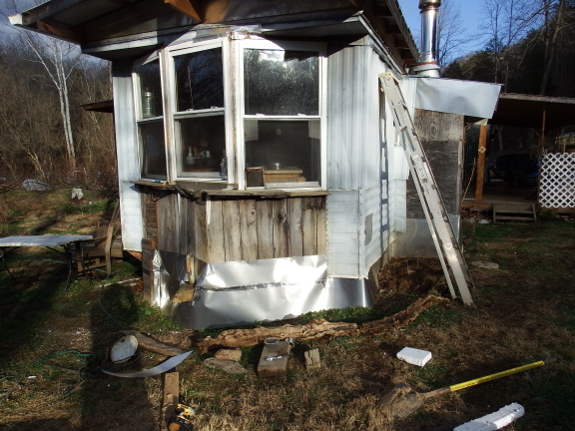 I am not living mine because it has a bunch of simple things to fix, like the area where the halves meet needs to be finished and covered up, plumbing needs to be connected, siding needs to be reinstalled, etc. I managed to put electricity to it with my wife, but doing drywall work or any finish work absolutely TERRIFIES me. Anyway, I just wanted to figure out why you have not removed the hitch from your home. Good luck with your project! If you haven't already, you might want to pick up Trailersteading, which is free today.